Snainton lies on the northern side of the Vale of Pickering, at a junction of the roads leading from Pickering and Malton. The A 170 then squeezes through the centre of the village and continues on for about 9 miles to the coast at Scarborough. The main area of the village occupies a shoulder of land above the lower lying land to the south. Whilst this southern area is crossed by some minor roads, it has a feeling of inaccessibility. Many of the roads from Snainton into the Carrs are in fact dead ends. Surrounding the village is largely a quiet, managed agricultural landscape devoted to arable use. However, immediately north of Snainton the ground is steeply sloping. This bank with its hedgerows and trees forms a distinctive backdrop to Snainton village which is largely contained at the foot of the slope. Snainton is not a purely dormitory village but is very much a working community with a wide range of businesses and commercial enterprises too numerous to list. According to the 2011 census, Snainton parish had a population of 754, a decrease on the previous figure of 891. In spite of this, the village continues to grow and evolve with small housing developments continuing to appear and young families ensuring a thriving pre-school and a primary school with 52 children in attendance. Across the road from the school is the village hall and playing field. Built originally in 1928, the hall has been modernised in recent years, doubling its capacity and making it an excellent venue for events large and small. The hall is fully licensed for music, theatre and entertainment and is also the meeting place for the playgroup. On the northeast corner of the playing field is a bright and cheerful play area and in the southwest corner is the Bowling Club. The field is also used for football and cricket. 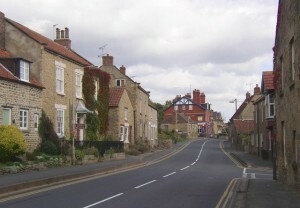 There are two public houses in Snainton. In the centre of the village, the Peacock Hotel provides a focal point for locals and visitors as well as residential accommodation and catering. Snainton’s old coaching inn, The Coachman, stands at the western end of the village opposite the Derwent Hunt Kennels and provides bar and dining facilities. Opposite the Peacock is the reading room, a meeting place for smaller events and the home of the parish council. St Stephen’s Church stands close to the centre of the village. The church was rebuilt in 1835 but the old lych-gate and font still remain. The Methodist chapel is on the corner of West Lane and Station Road and periodically shares meetings and services with St Stephen’s. Snainton also retains its post office and general store as well as an excellent medical practice but regrettably the village has recently lost its much valued fire station.